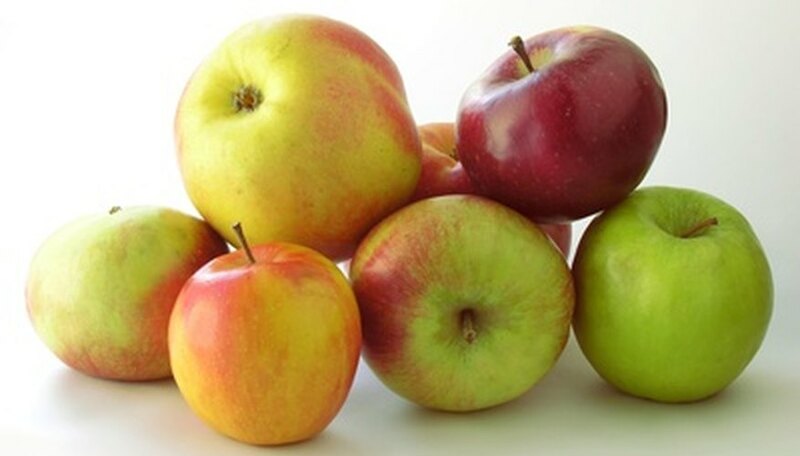 According to the Missouri Apple website, the rich soils and warm days and cool nights of August and September makes the Show Me State an exceptional place for producing deliciously flavored apples. Situated in U.S. Department of Agriculture hardiness zones 5 and 6, the chilly winters allow for a great many varieties of apples to grow successfully. Choose trees with good disease resistance and be aware the humid summer weather tends to yield softer apples than those grown farther north in the Midwest. One of the "big three" apples grown in Missouri orchards is the variety Jonathan, according to the Missouri Apples website. Unfortunately, it is highly susceptible to the primary diseases of apple trees: fireblight, scab, cedar apple rust and powdery mildew. Considerable treatment is needed on Jonathan apple trees to yield the best, most appealing (taste and appearance) fruit crops. Nonetheless, this variety is among the most popular apples with its soft but crisp tart flesh and red skin. Consider derived hybrids of the Jonathan with different disease resistances and fruit qualities such as Jonafree, Jonalicious and Jonagold. The variety Red Delicious is a standard crisp red apple, widely sold in supermarkets. In Missouri, this variety proves resistant to major apple tree diseases except for apple scab; in comparison to Jonathan, Red Delicious is easier to grow and get to yield high-quality fruits. Red Delicious apples are best harvested just after Labor Day, when they are still crisp in their flesh texture. Missouri Cooperative Extension Service mentions that the flesh tends to be bland in Red Delicious across the state, and fruits never attain that classic, attractive shape that those grown in the Pacific Northwest develop. Truly delicious in flavor, Golden Delicious fruits are yellow but tend to get a "russet" or slight red blush on the skin because of Missouri's humid climate. This tree tends to be susceptible to the same diseases as Jonathan. According to the Missouri Cooperative Extension Service, Golden Delicious tends to produce crops in alternating years. It recommends growing a derivative variety if you don't want apples that tend to reveal a russet color, such as Smoothee. By mid-October, the bright red apples on trees of Enterprise are ready for eating and harvesting. The large apples have a tart but sweet and juicy flesh that is firm. This semi-dwarf tree variety is exceptional it is resistance to the four major apple tree diseases. Fruits tend to prematurely drop in late summer as they get larger. If stored in a cool, dry location, Enterprise apples tend to last for months. Another semi-dwarf apple tree variety with good disease resistances is Goldrush. These large, yellow apples are ready for harvest in late October statewide. They also store for a long period in a cool, dry setting and tend to have improved flavor the longer they sit in storage, claims the "Sunset Western Garden Book." Overall, the flesh is juicy and semi-tart and sometimes the yellow skin can have slight russet hues.